Minister (Mrs) Funke Akinokun, the multi-lingua worship leader so gifted in praising God in various tongues, languages and dialects who is currently signed to One Hallelujah Records, the official record label of the Redeemed Christian Church of God (RCCG) shall be releasing three (3) Brand New Singles ahead of her forthcoming Brand New Album, and USA Album Presentation on the 15th of September, 2017. These three (3) New Singles speak for themselves, and really would help everyone connect to God in a special way. They will be released weekly, from the Friday 18th of August 2017 to the Friday 1st of September 2017, on all major blogs and digital platforms globally. Single #1 - (Title): 'HOLY IS OUR GOD' is a worship song that reverences God and His awesome nature. The song produced by Bode Afolabi shall be released on Friday, 18th August, 2017. Single #2 - (Title): 'MERCY' is a fresh sound with an age old message that our God continues to be merciful. This song produced by Wole Oni (for WOMP Music) shall be releasedon Friday, 25th August, 2017. Single #3 - (Title): 'OPE (THANKS)' is a danceable medley of thanksgiving & praise songs with depth. The song produced by Bode Afolabi shall be releasedon Friday, 1st September, 2017. 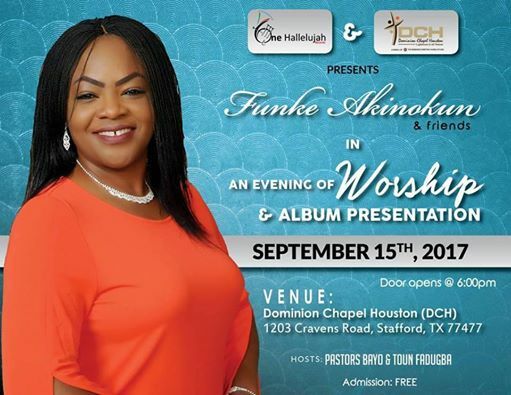 The multiple award winning Funke Akinokun with two previously successful albums under her belt will like to thank all her fans who have supported her ministry in one way or the other. She will further appreciate your support by helping her spread the word through social media on these new songs by blessing your friends and family when they are eventually released, and also going out to purchase the album from 15th September on all digital platforms. God Bless you.